Antioxidant activity relationship of phenolic compounds in Hypericum perforatumL. The St John's Wort (Hypericum perforatum; Clusiaceae) has been used in traditional and modern medicine for a long time due to its high content of biologically active phenolics. The purpose of this work was to develop a method for their fractionation and identification, and to determine the most active antioxidant compounds in plant extract. An LC-MS method which enables fast qualitative and semiquantitative analysis was developed. The composition determined is in agreement with the previous results, where 6 flavonoids, 4 naphthodianthrones and 4 phloroglucinols have been identified. Significant antioxidant activity was determined for most of the fractions by DPPH assay (the lowest IC50 of 0.52 μg/ml), NO scavenging (6.11 μg/ml), superoxide scavenging (1.86 μg/ml), lipid peroxidation (0.0079 μg/ml) and FRAP (the highest reduction capacity of 104 mg Fe equivalents/g) assays. LC-MS technique has been successfully applied for a quick separation and identification of the major components of H. perforatum fractions. Majority of the fractions analyzed have expressed a very high antioxidative activity when compared to synthetic antioxidants. The antioxidant activity could be attributed to flavonoids and phenolic acids, while phloroglucinols and naphthodianthrones showed no significant activity. It is demonstrated that it is possible to obtain, by fractionation, H. perforatum preparations with significantly increased phloroglucinols-to-naphthodianthrones ratio (up to 95:5). Hypericum perforatum L. (St. John's wort) is a representative of the Clusiaceae family with confirmed therapeutic effects on burns, bruises, swelling, anxiety, mild to moderate depression , antidepressant, antiviral, wound healing, analgesic, hepatoprotective, antioxidant and antimicrobial activity [2–5]. Hyperforin is believed to be the major constituent responsible for the antidepressant activity, although discrepancies in the dose-response relationship imply that other constituents are also involved . Naphthodianthrones, especially hypericin-like compounds, are shown to posses a strong antiviral effect . Flavonoids are of a special interest due to their antioxidative properties i.e. excellent radical scavenging ability . Reactive oxygen species (ROS) have been implicated in pathogenesis of many diseases, including cancer, mutagenesis, Alzheimer's, AIDS, etc. . Many synthetic antioxidants are currently in use; nevertheless, there is a growing evidence of consumer preference for natural antioxidants because of their potentially lower toxicity. H. perforatum extracts are already proven to inhibit lipid peroxidation in vivo . Previous results  demonstrated that H. perforatum fractions, obtained by successive liquid-liquid extractions with solvents of different polarities, have different epileptic activities (ranging from inhibitory to stimulatory), and that this approach can point out to compounds responsible for pharmacological activity. In this work eight fractions of H. perforatum, obtained by an externally developed method of fractionation devised to separate main constituents of the plant, were examined. The chemical composition of all extracts has been analyzed by rapid-resolution liquid chromatography, as opposed to the previously used classical high-performance liquid chromatography [10–18]. Antioxidant activity has been assessed by scavenging DPPH radical, NO radical, superoxide anion radical, FRAP test, and lipid peroxidation using a linseed oil as a substrate. Where possible, synthetic antioxidants BHT (3,5-di-tert-butyl-4-hydroxytoluene) and BHA (2-tert-butyl-4-hydroxyanisole) were used as standards. An attempt was made to correlate chemical composition of the extracts with its antioxidant activity and determine which group of biomolecules is the most potent. LC-MS technique has been successfully applied for a quick separation and identification of the major components of H. perforatum fractions. Detected compounds are representatives of three groups: flavonoids, naphthodianthrones and phloroglucinols. Peaks identification was done by comparing the mass spectra and retention times with already published data . Four naphthodianthrones (protopseudohypericin, pseudohypericin, protohypericin and hypericin) and four phloroglucinols (hyperfirin, adhyperfirin, hyperforin, adhyperforin) were identified together with several flavonoids (hyperoside, rutin, quercitrin and quercetin) and a small amount of caffeoylquinic acid (Table 1). The grouping of compounds by classes is observed, with flavonoids and phenolic acids eluting between 0 and 2.5 min, naphthodianthrones in 2.5-4.7 min, and phloroglucinols in 4.7-6.5 min interval (Figure 1). The relative abundance of each group is determined by the normalization method, as an area percent of all peaks with similar spectra eluting within a given retention time range (Table 2). It is important to note that area percents, although useful for the comparison of the fractions' purity, neither directly correspond to the percentage composition in weight or amount, nor account for the total content of the compounds. Since there were no reference standards available, total peak areas (divided by the injected mass of extract) were used as a measure of the absolute content of the separate compound classes. Retention times and [M-H]- ions of identified peaks. Relative abundancesa of compound classes in analyzed fractions. All fractions were subjected to the antioxidant activity assays, with results given in Table 3. Activities varied widely, from very high to moderate. All samples demonstrated ability to scavenge DPPH radicals, where most of them had IC50 value lower than the synthetic antioxidants BHT and BHA, except the fraction I/4. Superoxide anion scavenging was also observed, with IC50 values in range 1.86-32.4 μg/mL (the most active being I/2 and the least active I/5). Under the same experimental conditions, synthetic antioxidants BHT and BHA did not reach 50% inhibition due to their low solubility in the reaction medium (water). Inhibition of lipid peroxidation by extract fractions was also demonstrated, with IC50 higher (i.e. lower activity) than the synthetic antioxidants. Most of the fractions have shown scavenger activity in neutralizing NO radical. For fractions I/2 and I/4 it was not possible to determine IC50 values because neutralization of 50% NO radicals was not accomplished even with the highest concentrations of 22 μg/mL and 120 μg/mL, respectively. Under the experimental conditions, synthetic antioxidants BHT and BHA did not reach 50% inhibition due to their low solubility in water. Results of antioxidant activity assays. b mass of Fe3+ that can be reduced by 1 g of H. perforatum fraction. It has already been demonstrated [10, 17, 19] that Hypericum perforatum extracts contain several classes of plant phenolics with a documented biological activity, including antidepressant phloroglucinols (hyperforin and its derivative adhyperforin), antiviral, antibacterial and photosensitizing naphthodianthrones (hypericin and pseudohypericin, as well as their precursors - protohypericin and protopseudohypericin), antioxidant flavonoids (mostly quercetin and kaempferol glycosides and aglycones, as well as biflavonoids), and phenolic acids (mostly isomeric caffeoylquinic acids). For the purpose of pharmaceutical products production, the preparation of the enriched extracts may be of interest. In this paper, it has been demonstrated that it is possible to obtain extracts with high levels of phloroglucinols (I/4) and naphthodianthrones (I/5) by using a relatively simple procedure. The antioxidant activity of H. perforatum extracts is well known [4, 20] and is to be expected due to a high content of phenolic compounds. Although several publications were focused on this topic [21, 22], there is still a lack of conclusive evidence to determine which phenolics class is the most responsible for the antioxidant activity of Hypericum plants. Since the procedure described in this paper enabled the isolation of extract fractions enriched in different groups of phenolics, it was possible to establish the correlation between the extract composition and activity, and to distinguish structural features most important for scavenging and antioxidant properties. In addition, synergistic action of certain compounds is also to be expected. Since it is now recognized that there is no single test to evaluate antioxidant activities of the compounds with wide spectra of structures, modes of action, and physical and chemical properties , several different assays were employed as a part of our investigation. DPPH (2,2-diphenyl-1-picrylhydrazyl) is a stable radical and is often used in assessment of the antioxidant activity. The free radical DPPH possesses a characteristic absorption at 517 nm (purple in color), which decreases significantly when exposed to radical-scavengers (due to hydrogen atoms transfer from antioxidant to DPPH). A lower absorbance at 517 nm indicates a higher radical-scavenging activity of extract . In this assay, the ability of the investigated H. perforatum fractions to act as donors of hydrogen atoms or electrons in transformation of DPPH radical into its reduced form DPPH-H was investigated. The activity observed is in a very good correlation with the composition, where the most active fractions are those rich in flavonoid glycosides (followed by minute amounts of phenolic acids) and poor in biflavonoids (amentoflavone, biapigenin): I/2, II/2p and II/2s. As opposed to this, fractions with high biflavonoids level and low flavonoid glycosides content (I/3, I/5) exhibited significantly lower activity (i.e. higher IC50 values), and fraction I-4, practically devoid of flavonoids and phenolic acids, was the least active. It is notable that only flavonoid glycosides (with quercetin-3-O-rutinoside, galactoside and rhamnoside as the most abundant) seem to contribute significantly to radical-scavenging activity (given as 1/IC50), with Pearson's correlation coefficient r = 0.778 (0.922 if the outlier - II/2p - is excluded), together with phenolic acids (r = 0.769, or 0.929 without II/2p). These observations are only partially in agreement with the previous results . While it would be expected for flavonoid aglycones to be more active than their 3-O-glycosides , no correlation was found between aglycones content and antioxidant activity as determined by DPPH test, and the activity of fractions I/3 and I/5 (rich in flavonoid and biflavonoid aglycones, poor in glycosides and phenolic acids) is low. At the same time, no correlation was found between activity and content of naphthodianthrones and phloroglucinols, which is in accordance with the results of Silva et al. . The low activity of biflavonoids present in Hypericum perforatum extracts was already documented  and is to be expected. These compounds, being dimers of apigenin, possess only 4'-hydroxyl on B-ring, while it is known that for maximum activity a catechol structure (3',4'-dihydroxylated benzene moiety), as present in quercetin, is required [21–23, 25]. FRAP test is based on nonspecific reduction of Fe3+-TPTZ into the blue Fe2+-TPTZ by the extract, which leads to an increased absorbance at 593 nm. Results are presented as mg of Fe2+/1 g of dried fraction and represent the mass of Fe3+ that can be reduced by 1 g of H. perforatum fraction. Several important facts should be kept in mind when interpreting results of the test. First, it measures ability of a sample to participate in one-electron redox reactions, meaning that antioxidants with different mode of action (e.g. carotenoids, behaving as radical scavengers) will not be ignored. Second, only water-soluble antioxidants will react since the assay is performed in aqueous solution. Third, the reduction capacity determined in the absence of biomolecules as substrates does not necessarily reflect the antioxidant activity i.e. protective capabilities. Still, it can be a relevant factor in detoxification of reactive species such as HOCl and ONOO- . FRAP test has shown that H. perforatum fractions have the significant reduction potential, with fractions I/1, I/2 and II/2p being more active than the synthetic antioxidant BHT. Taking into account the results of HPLC analysis, reduction capacity may be attributed mostly to the content of phenolic acids and flavonoid glycosides (although Pearson's correlation coefficients are quite low, 0.768 and 0.584, respectively). The contribution of phloroglucinols to the total reduction capacity is negligible - two fractions rich in these compounds, I/4 and I/3, exhibited the lowest capacity of all the samples examined. Their inactivity can be explained by the lack of easily oxidizable functional groups (such as phenolic moiety). The low activity is also observed for naphthodianthrones and biflavonoids, fractions with especially high content of these compounds (I/3, II/3, I/4, I/5) having the lowest reduction capacity. In superoxide anion test the ability of H. perforatum fractions to neutralize superoxide anion radical (O2 -) was evaluated. While superoxide is intentionally produced by some cells (phagocytes) in order to combat infection, its presence is usually deleterious to organism, leading (if not degraded by superoxide dismutase) to degenerative processes and death. In the employed assay, O2 - anion was generated in situ, by electron-transfer from NADH to O2 present in solution (a process analogous to NADPH oxidase- and NADH dehydrogenase-catalyzed generation in vivo) . All investigated extract fractions exhibited dose-dependent O2 - scavenging activity. The weakest activity was again observed in samples rich in biflavonoids, naphthodianthrones and phloroglucinols but with low levels of other phenolics - I/4 and I/5. A high degree of correlation was found between the activity (expressed as 1/IC50) and the content of phenolic acids (r = 0.857), flavonoid aglycones (r = 0.791, without the outlier I/5: r = 0.926), and sum of phenolic acids, flavonoid aglycones and glycosides (r = 0.883, or 0.921 without fraction I/5). These observations are in agreement with the empirical rule that a catechol moiety (present both in quercetin and in caffeoylquinic acid) is required for a maximum radical-scavenging activity [21–23, 25]. One of the main detrimental effects of reactive radical species (especially OH·) is lipid peroxidation (LP) i.e. oxidative degradation of lipids, leading to biological membranes damage and, possibly, to cell death or formation of mutagenic/carcinogenic products. The best known LP product is malondialdehyde (MDA) and it has been used most widely as a biomarker in various studies associated with lipid peroxidation. Determination of MDA may be problematic because of its high reactivity and water solubility, and it is therefore necessary to generate stable derivatives. One of the most commonly used is thiobarbituric acid adduct, which can be determined using spectrophotometry. In our research, linseed oil was used as a substrate for LP due to its high content of polyunsaturated fatty acids. LP of polyunsaturated fatty acids was triggered by Fe2+ and ascorbate (which, through Fenton reaction, generate OH· radicals) . All samples were able to inhibit lipid peroxidation in a dose-dependent manner, although not as efficient as synthetic antioxidants BHT and BHA. It is notable that fraction I/4, by far the poorest in flavonoids and phenolic acids and one of the least active in DPPH, FRAP, superoxide scavenging and NO scavenging assays, exhibited very strong LP-inhibiting activity, matched only by I/1. On the other hand, fraction II/2p, among the most active in mentioned assays, was second-to-weakest in this assay. It was not possible to correlate the test results with chemical composition of fractions. These results are in disagreement with those of Silva et al. , which implied flavonoids as main anti-LP constituents of Hypericum perforatum extracts. It should be noted that the effects of plant phenolics on Fe2+/ascorbate-induced lipid peroxidation are complex. It is known that flavonoids, especially those with catechol-like substitution on B ring and either 4-oxo-3-hydroxy or 4-oxo-5-xydroxy, are efficient in inhibiting LP, both through radical scavenging and through chelation of iron ions. On the other hand, in the presence of transition metal ions, flavonoids also exhibit pro-oxidant effect , continuously reducing these ions and thus enabling them to generate OH· via Fenton reaction. Biflavonoids, while being very poor radical scavengers, are proven to inhibit LP with similar potency as flavonoid glycosides, probably through iron chelation , while naphthodianthrones and phloroglucinols are not active . Finally, nitric oxide scavenging ability was also assayed for all fractions. While NO is normally produced in organism as a messenger and as a part of immune response, its reaction with O2 - produces highly reactive peroxynitrite that can damage various biomolecules. Thus, the ability of extracts to neutralize NO and ONOO- can have beneficial effects. While all investigated extract fractions demonstrated dose-dependent scavenging of NO, for most of them IC50 values were high (or, in the case of I/2 and I/4, 50% neutralization was not accomplished within the examined concentration range). As with lipid peroxidation assay, it was not possible to attribute the NO scavenging activity to any particular class of phenolics. In conclusion, by using fractionation combined with assays and LC-MS analysis, it was possible to identify compound classes responsible for H. perforatum antioxidant activity. It was demonstrated that it can mostly be attributed to flavonoid glycosides and phenolic acids (chlorogenic acid), while phloroglucinols (lacking polyphenolic structure), biflavonoids (lacking catechol moiety) and naphthodianthrones showed no significant activity. Following reagents were purchased from Sigma-Aldrich Chem, Steinheim, Germany: BHT, BHA, NADH, phenazine methosulfate (PMS). Sulfanilamide, 2,2-diphenyl-1-picrylhydrazyl (DPPH), and 2-thiobarbituric acid (TBA) were obtained from Fluka Chemie GmbH (Buchs, Switzerland). Trichloroacetic acid was purchased from Lach-Ner (Neratovice, Czech Republic), nitroblue tetrazolium (NBT) from Alfa Aesar (Karlsruhe, Germany), and sodium nitroprusside (SNP) from Reanal (Budapest, Hungary). N-(1-naphthyl) ethylenediamine dihydrochloride (NEDA), ascorbic acid, 2,4,6-tripyridil-s-triazine (TPTZ), and formic acid was acquired from Merck, Darmstadt, Germany. Tween-80 and gradient-grade acetonitrile were obtained from J. T. Baker (Deventer, Netherlands). Linseed oil is prepared by solvent extraction of linseed, and fatty acids composition is determined by GC-MS to be: linolenic 69.7%, linoleic 13.5%, stearic 9.4% and palmitic 7.4%. FRAP reagent was made by mixing 50 ml of acetate buffer (0.3 mol/L, pH = 3.6), 5 mL of FeCl3· 6H2O (20 mmol/L) and 5 mL of TPTZ solution (10 mol/L in 40 mmol/L HCl). TBA reagent was prepared by dissolving 3 g of TBA, 120 g of trichloroacetic acid and 10.4 mL of perchloric acid in water and filling up to 1 L. All chemicals were reagent grade, unless otherwise stated. Hypericum perforatum L. (Clusiaceae) samples were collected mid July 2007 from the mountain Čemernik, south of Serbia, at blooming stage. The voucher specimen (No. 11340) is deposited at the Herbarium of the Institute of Botany and Botanical Garden "Jevremovac", Faculty of Biology, University of Belgrade (BEOU). Top flowering parts were used for extract preparation (80% flowers and 20% rest of the plant). Plant material was dried and powdered, and dried again at 105°C by steam heating. The extraction and fractionation were performed using third party-developed procedure (patent pending). Dried and powdered plant material was depigmentated using chloroform extraction for 96 h and, after vacuum-drying, extracted for 72 h with eight-fold amount of methanol. Both extractions were carried out at temperatures near the boiling points of the respective solvents. The process yielded 6-7% of raw extract on dry weight basis. After removal of carotenoids by petroleum ether extraction and glycosides by ethyl acetate/water partitioning, the residue was fractionated using Sephadex LH-20 column to give five fractions (based on colour and UV/VIS absorption spectra), labelled I/1 to I/5 for the first batch of plant material, and II/1 to II/5 for the second batch (of which, only sub-fractions II/2s and II/2p, and fraction II/3 were analyzed). For the purpose of LC analysis and antioxidant assays, all fractions were dissolved in methanol (except fraction I/4, for which iso-propanol was used, due to low solubility in methanol). 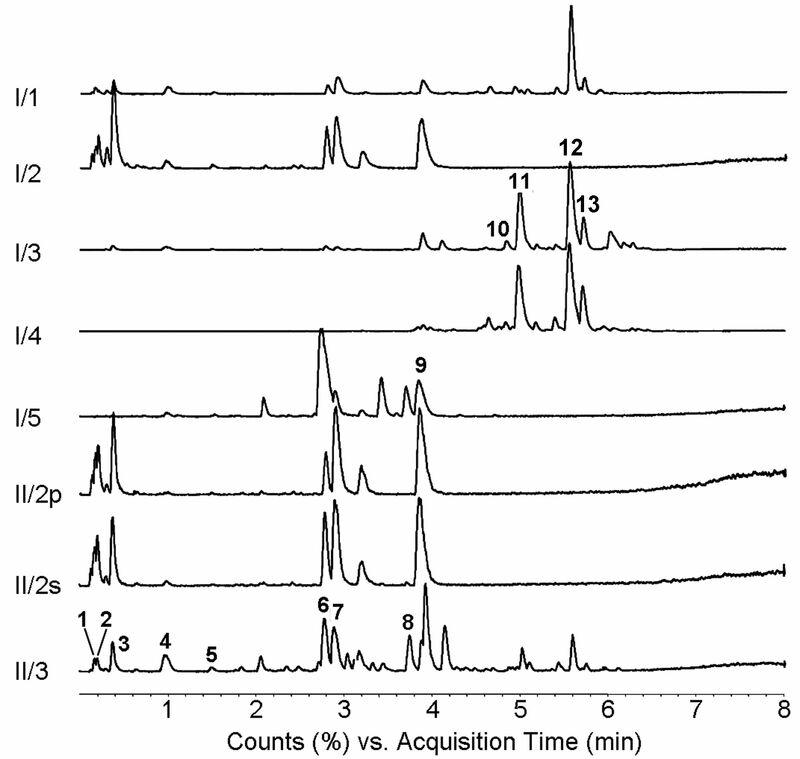 Chemical composition of fractions was determined by rapid resolution liquid chromatography with mass selective detection, using Agilent Technologies 1200 Series liquid chromatograph coupled with Agilent Technologies 6410B Series triple-quad (QQQ) mass spectrometer. Components were separated using reversed-phase Zorbax SB-C18 30 mm × 2.1 mm × 3.5 μm column (Agilent Technologies), held at 50°C. The mobile phase was delivered in gradient mode (0 min 25% B, 6 min 100% B, 8 min 100% B, solvent A being 0.1% aqueous formic acid with 10 mmol/L CH3COONH4, and solvent B being acetonitrile), with flow rate of 1 mL/min. Injection volume was 1 μL, except for sample I/5, for which 0.1 μL was used to improve peak shape. Eluted components were ionized by electrospray ion source (ESI), using N2 for nebulization (pressure of 35 psi) and drying (flow of 9 L/min, temperature of 350°C). Capillary voltage was 4000 V and fragmentor voltage 80 V. To increase the sensitivity, lower the noise, and simplify the spectra, negative ionization was used. Generated [M-H]- ions were analyzed using MS2Scan mode, in m/z range 200-800 Da. where A average is absorbance of probe, at a given sample concentration level (average of three probes); A corr is the correction or the absorbance of the extract alone (without reagents), and A control is the absorbance of the reagent (DPPH radical) without the extract. The extract concentration in reaction mixture, resulting in 50% inhibition of DPPH radicals (IC50), was calculated from the RSC vs. extract concentration curve. Selected concentrations (ranging 0.001-12 mg/mL) of H. perforatum fractions (10 μL) were treated with 300 μL of FRAP reagent in triplicate. Correction (absorbance of the untreated extract) and control (absorbance of the FRAP reagent) were also measured. After 6 min of incubation, the absorbance was measured at 593 nm by the microplate reader (Multiskan Spectrum, Thermo Corporation). The calibration curve was constructed using the aqueous solution of Fe2+ in series of concentration ranging 50-1000 μmol/L. The results were given as mg of Fe2+ per gram of dry extract. Selected concentrations (ranging 0.001-12 mg/mL) of H. perforatum fractions (10 μL) were mixed with 40 μL of 144 μmol/L NBT, 20 μL of 677 μmol/L NADH, 20 μL of 60 μmol/L PMS and 220 μL of pH 8.3 buffer in triplicate. Correction (absorbance of untreated extract) and control (absorbance of reagents without extract) were also measured. After 5 min of incubation absorbance was measured at 560 nm by the microplate reader (Multiskan Spectrum, Thermo Corporation). The values of RSC and IC50 were calculated in the same manner as in DPPH test. Selected concentrations (ranging 0.001-12 mg/mL) of H. perforatum fractions (10 μL) were mixed with 75 μL of SNP and 75 μL of phosphate buffer (0.067 mol/L, pH = 7.4) in triplicate. Correction (absorbance of untreated extract) and control (absorbance of reagents without extract) were also measured. Samples were incubated under a fluorescent lamp for 1 h. After the incubation, in each well 150 μL of Griess reagent was added and the absorbance was measured at 546 nm by microplate reader (Multiskan Spectrum, Thermo Corporation). The values of RSC and IC50 were calculated in the same manner as in DPPH test. As a substrate for lipid peroxidation, linseed oil (prepared in-laboratory by hexane extraction of linseed) was emulsified in phosphate buffer (0.035% v/v solution) with addition of Tween-80 (0.25% v/v solution) as an emulsifier. Selected concentrations (ranging 0.0001-1.2 mg/mL) of H. perforatum fractions (10 μL), each in triplicate, were mixed with 20 μL of 1.875 mmol/L FeSO4 and 20 μL of ascorbate (15.4 μg/mL). The control and corrections were also made as previously defined. All probes were incubated at 37°C for 1 h, after which 200 μL of 0.1 mol/L EDTA was added to bind the Fe2+, thus stopping the reaction. TBA reagent (2 mL) was added, and the mixture was heated in boiling water bath for 15 min to form a stable, colored derivative with MDA . After that, probes were centrifuged for 15 min at 3700 rpm and the absorbance was measured at 532 nm. The values of RSC and IC50 were calculated in the same manner as in DPPH test. This research is funded by Serbian Ministry of Science and Technological Development research grant Nr. 172058. and Provincial Secretariat for Sciences and Technological Development (grants 2011-2014). SSP performed sample preparations and fractionation of plant material. DZO developed LC/MS method, performed qualitative phenolics analysis, and contributed to the results interpretation. MMF and EĐJ performed antioxidant assays. NMMD coordinated the study, participated in its design and contributed to drafting manuscript. All authors have read and approved the final manuscript.